Anode stopper resistors, to damp oscillation or providing a way to measure anode current. The default circuit is a push-pull amp with balanced inputs, including a dual-gang master volume (optional if you jumper the pads). 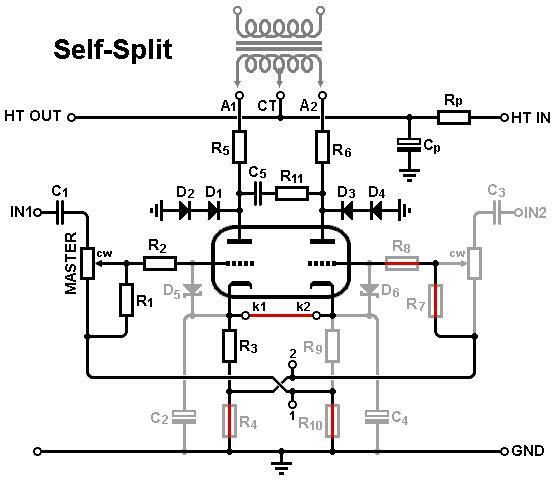 What's unusual about this circuit is that it uses cross-coupled cathode bias (some people call this 'Garter bias'). This is a smart way to force the idle currents in each triode to match almost exactly, even if the triodes are quite mismatched. Each triode effectively servos the other one, resulting in an idle current that is the average of the currents we would ordinarily get without cross coupling. They will also remain closely matched with age, which is exactly what we want to minimise DC offset in the output transformer. R3 and R9 are selected to be the usual bias resistors and, once chosen, they must be stacked upon two more identical resistors R4 and R10. Of course, this wastes some available voltage and therefore reduces the available output power, which is why you don't see this sort of biasing very often. But for a mini power stage this is unlikely to matter, so give it a try! 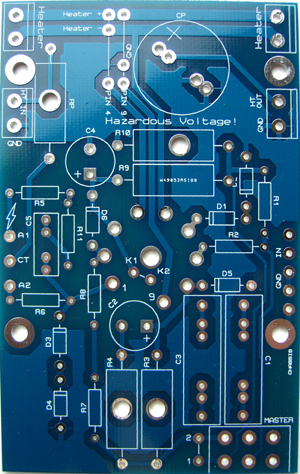 The second option is a classic differential amplifier. This is accomplished by linking the two cathodes together as indicated by the red links, and also by linking the two grid leaks together with pads 1 and 2. This is basically a long-tailed pair, but driving an output transformer. This means the circuit will accept a single input signal and provide it's own phase inversion for push-pull operation, just like any LTP. This could be a useful space saver in a small circuit, since no addition phase inverter is needed. Alternatively, being a differential amplifier, you can provide balanced input signals and take advantage of the circuit's superior CMRR. 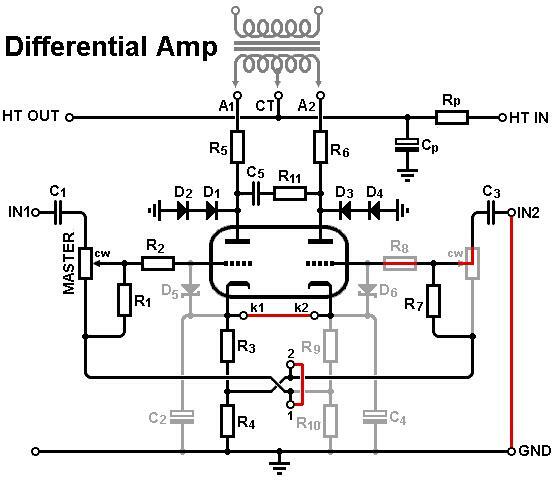 The third option is a stripped-down differential amp, sometimes called a 'self-split' arrangement or even a 'short-tailed pair'. 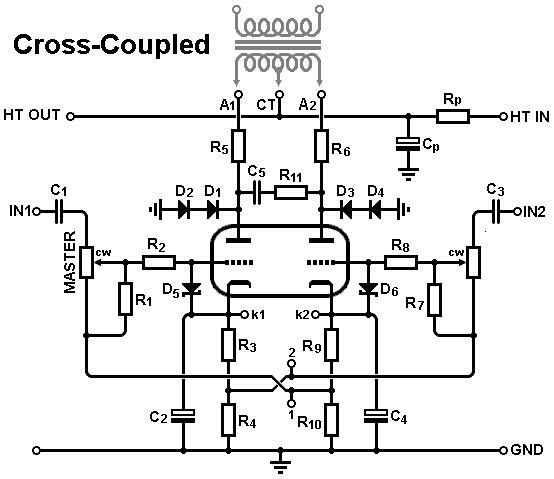 Here both triode share a single common-cathode bias resistor (R3) and nothing more. This results in worse AC balance since the first triode has to work as an amplifier and a very crude cathode follower, and therefore output power is reduced and efficiency is poor, but parts count is low. But again, in a mini output stage this may not matter to you. You may have seen this arrangement used in Doug H's Firefly. See the shop page for pricing.